The Chonnam Tribune asked domestic and foreign students about sanctions on North Korea, the possibility of unification of the Korean Peninsula and the Chinese government’s response to the current situation and North and South relations and so on. – Ed. The bright future of North and South Korea is expected from the deep corner of inhabitants after their long black history, which was like a cold war between South and North Korea, and the chilling wind also disseminated to the whole world. 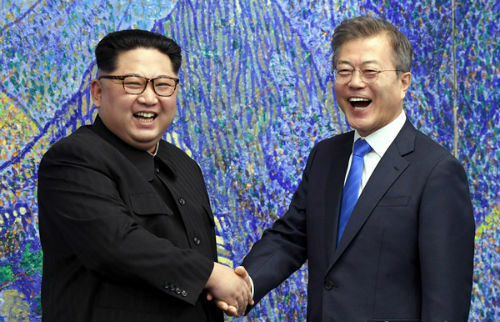 However, beginning with North Korea's participation in the 2018 PyeongChang Winter Olympics in South Korea, the relationship has seen a major diplomatic breakthrough and become significantly warmer. Meanwhile, the U.S. has been arguing about the complete denuclearization of North Korea as soon as possible. North Korea has been insisting that the U.S. make its residents feel safe before expecting them to give up their nuclear weapons. It is also another obstacle why American officials are reluctant to agree a declaration on the ending of the Korean War. Although the South Korean Government is trying to intervene in disputes between North Korea and the U.S., it still seems to be a long way to a completely peaceful Korean peninsula. In this article, the Chonnam Tribune listened to the opinions of domestic and foreign students about this keen issue. What do you think of the United Nation’s guarantees to life sanctions in North Korea? Taillefer Lucie (France): I am not really aware of politics. But, anyways, how can one be sure that North Korea really has a nuclear missile, or at least, that they will probably get one? So those sanctions are maybe too strong. On the grounds of this fact, sanctions centered on economic and financial sectors firstly affect the population who are already suffering from hard living conditions. I am persuaded that the government does not feel, for the moment, problems connected to these punishments of other influential countries. The politicians continue to live easily while its lower class suffers. Maybe the U.N. Security Council should keep an eye on North Korea without imposing harsh sanctions on them. What can be the prime trigger of the unexpected relationship of North and South Korea? Nasyirat Nu man (Malaysia): The prime reason of the sudden change in heart is mostly definite pragmatism. Tangibly, North Korea could not sustain its economy alone without the help of neighboring countries. In the past years, the Soviet Union was a helping hand to North Korea but after the collapse of the Soviet Union, China has continued the trend. However, nowadays China is also slowly distancing itself from the hermit nation. So, with its only ally seemingly trying to cut ties and being sanctioned from other countries, Kim Jong-un goes for the diplomatic actions and is warming up the relationship with their Southern counterpart. By that, he hopes the economic sanctions are going to be lightened, which is really needed in North Korea. What are the possible outcomes of unification of North and South Korea? Seo ye-rin (South Korea): I think inter-Korean unification will increase its international status and economic growth (this will take a lot of time). However, there are some fears of Korea’s rising power to a counterpart China regarding history-related problems such as the Northeast Process and so on. Moreover, there will be undesirable consequences like overcoming cultural heterogeneity. But the most important outcome is more opportunity to enhance Korea’s international status in Northeast Asia. The unification of the Korean peninsula will cause its neighboring countries to breathe for a while or to renew their foreign policies for South Korea for their own national interest. Using the chance to unify Korea, which will bring a fresh shock to the balance of power in the Northeastern Asian region, where the G2 powers of the United States and China are held. What do you think about the North Korean nuclear negotiation and six-party talks? Jin Huanhuan (China): To be honest, I am not knowledgeable in the field of politics, but I think China should be together in the six-party talks including North and South Korea and the United States. On the grounds that China and North Korea are neighboring countries, they are determined to a great extend to what one another are doing. Moreover, the two countries’ relationships are great. As North and South Korean relations is one of big issues in the world, the Chinese government should definitely be concerned about it. According to a Chinese daily newspaper, Wang Yi, the secretary of state for foreign affairs, made the speech in the U.N. Security Council’s hearing, “China values the political decisions made by the leaders of the two Koreans and firmly supports the joint recognition of the summit as concrete action.” As we look at Wang’s speech, we can see how China is supporting the two countries’ good relationship. Do you think that the reunification of North and South Korea makes a difference in the lives of North Koreans? Adriana Gaston (Poland): I consider it to be one of the prime debates of the world. Personally, I hope that both countries will not be enemies anymore and the Korean peninsula will not be in danger. So, I ponder that the reunification of North and South Korea will be helpful to North Korean citizens to a great extent. On the grounds of the press, in North Korea there were many human rights violations which should be taken very seriously. From my presumption, the reunification of North and South Korea can relieve dehumanization in the North. What do you think about the U.S.’s maintaining sanctions against North Korea? Holly Katharine D. (Australia): The U.S. government believes that international sanctions should be maintained until North Korean denuclearization is completely realized. From my point of view, the U.S. government is prioritizing human safety. Therefore, there is no tangible reason of sudden reunification of North and South Korea, and it might change the current condition quickly, too. I think there is no guarantor that promises nuclear dismantling. For these reasons, I strongly believe that the U.S. should continue to take a skeptical look at North Korea but at the same time they should help economically as promised on the second summit of North Korea and Washington. What problems may South Koreans face that arise from the unification of North and South Korea? Renata Galvelyte (Lithuania): From my perspective, one of the most terrifying and frightening problems would be the significantly increased rate of violence and crimes in South Korea due to the gigantic gap between the economies of North and South Korea. The reality is that there is a lack of proper, modern and technology-based education, work experience, perception of working environment and regulations in North Korea. Thus, North Koreans may have serious problems in getting not only prestigious, but even menial, decent jobs. Unless the South Korean government creates real and practicable plans and social policies for the integration of North Koreans, there is a long way to go.